Flora Ella Maud Bickett was born February 25, 1878, in the 3rd Ward, City of Xenia, Greene Co., OH, and died December 28, 1917, in the Village of Yellow Springs, Miami Twp., Greene Co., OH, at age 39. Buried in Glen Forest Cemetery, Yellow Springs, Greene Co., OH. She is the daughter of George McVey Bickett of Xenia Twp., Greene Co., OH, and Ruth Elizabeth "Lizzie" Simons of Clark Co., OH. Never married. Arnold Reed Bickett, Ruth Elizabeth "Lizzie" (Simons) Bickett and Flora Ella Maud Bickett are buried in Glen Forest Cemetery, Yellow Springs, Greene Co., OH. Thanks to Find-A-Grave for making this image available. 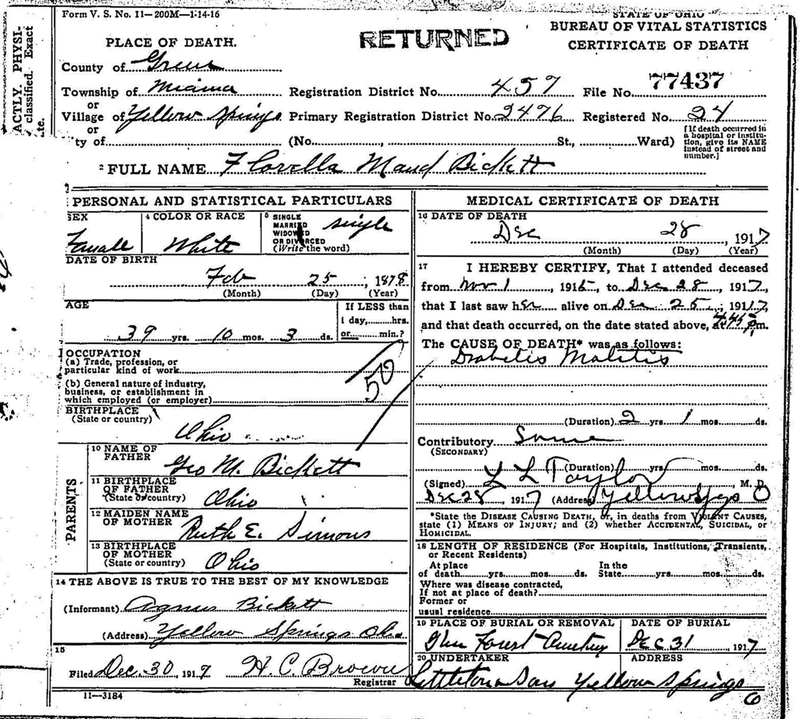 Flora Ella Maud Bickett was born February 25, 1878, in the 3rd Ward, City of Xenia, Greene Co., OH. Flora Ella Maud Bickett Birth Record. 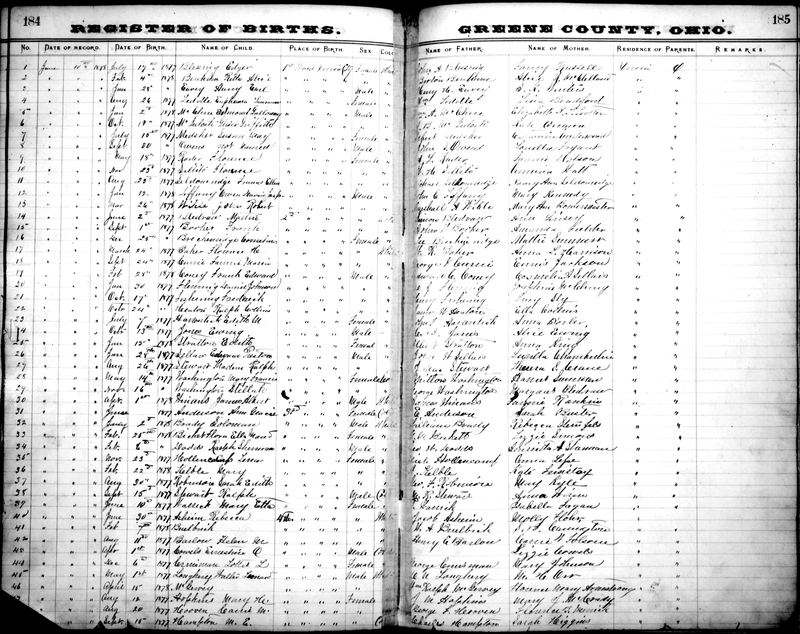 The 1880 U. S. Census taken on June 9, 1880, shows George Bickett (age 28) born in Ohio to Ohio-born parents is a Plumber living on Hinling Street, 3rd Ward, Xenia, Xenia Twp., Greene Co., OH. Living with him is his wife, Elizabeth Bickett (age 27) born in Ohio to Ohio-born parents. Also living at home are his children, all born in Ohio: Arnold Bickett (age 4); and Maud Bickett (age 2). Also living there is a boarder, William Simons (age 25), a Coal Merchant. Leigh Larson note: William Simons is the brother of Ruth Elizabeth (Simons) Bickett. 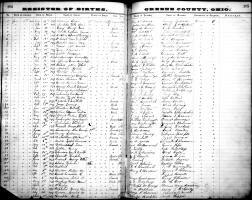 The 1900 U. S. Census taken on June 14, 1900, shows George M. Bickett (age 48) born September 1851 in Ohio to Ohio-born parents is a Plumber living in his own home in Xenia, Xenia Twp., Greene Co., OH. Living with him is his wife of 24 years, Ruth E. Bickett (age 47) born in Ohio to New York-born parents, with 5 of her 6 children still alive. Also living at home are his children, all unmarried and born in Ohio: Arnold R. Bickett (age 23) born August 1876, not employed and can not read or write; Maud F. Bickett (age 22) born February 1878 and not employed; Leroy Mc Bickett (age 18) born May 1882, a Blacksmith; Manley E. Bickett (age 14) born September 1885; and Dora A. Bickett (age 11) born August 1888. The 1910 U. S. Census taken on April 16, 1910, shows Geo. M. Bickett (age 57) born in Ohio to Ohio-born parents is a Plumber in a Shop living in his own home at 242 South Chestnut Street, Xenia, Xenia Twp., Greene Co., OH. Living with him is his wife of 35 years, Ruth E. Bickett (age 56) born in Ohio to New York-born parents, with 5 of her 6 children still alive. Also living at home are his children, all unmarried and born in Ohio: Arnold R. Bickett (age 34) and not employed and can not read or write; Maud F. Bickett (age 32) and not employed; LeRoy M. Bickett (age 26), employed in Tire Repairing in a Shop; Earl M. Bickett (age 24), not employed; and Agnes Bickett (age 21), a School Teacher in a Public School. Flora Ella Maud Bickett died December 28, 1917, in the Village of Yellow Springs, Miami Twp., Greene Co., OH, at age 39. Buried in Glen Forest Cemetery, Yellow Springs, Greene Co., OH. 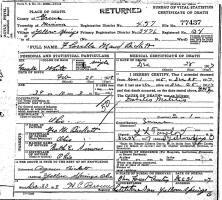 Flora Ella Maud Bickett Death Record. Primary Cause of Death: Diabetes Mellitus of 2 years and 1 month. Secondary Cause of Death: Same.